By now, most are aware of the U.S. man killed in a shark attack off Mexico’s southern Pacific coast near Acapulco this past week. The news that San Francisco, Ca. surfer Adrian Ruiz was fatally bitten while on a surf trip hit home for many in our community, especially being proceeded a week earlier by the death of a swimmer off of the shores of San Diego after being bitten by a white shark. Both of these incidents were tragic in the sense that many family members and friends unexpectedly lost someone in a highly unusual manner. Our hearts go out to them and we wish them the best. Unfortunately, the tragedy of the Mexico incident hasn’t stopped as authorities have decided to go with the ‘genius-method’ and slaughter any type of shark that may be in the area or simply passing through. Mexico’s Navy and maritime authorities say they have strung about 200 yards off lines with baited hooks near the beach in an attempt to catch sharks that may be using the area as a feeding ground. Navy Cmdr. Arturo Bernal, one of the authorities overseeing this unbelievable display of complete ignorance, stated that they “hope to catch any sharks in the area” and noted that this was the only way to prevent further attacks. If this Navy Commander was serious and able to spit out such nonsensical rhetoric with a straight face, there is no doubt a position waiting for him in the Bush administration once he has completed the task of eradicating each shark from the area. Pictures of the slaughter have come to light. If a picture truly does say a thousand words… these say it all. Posted by Shaun	on Monday, May 5th, 2008	in Surfing. Brilliant, that’ll stop them from doing it again. Or maybe at least endanger them. It must have been a suggestion from all of those Mexican marine biologists that work for the Mexican Navy. do u think the mexican authority official “listen” and follow suggestions by the scientific staff?? they only perform populists actions.. I think that this is uncalled for. We are slowing killing off their food source and we are taking away their environments, building shipping yards and dumping in the ocean. Then we expect them to starve to death, then they mistake a human for food, and we damn them all to death, to me the victims are the sharks. I really wish humans would realize what they are doing before it is to late. This just opens up more water for more larger sharks to look for smaller prey to eat. 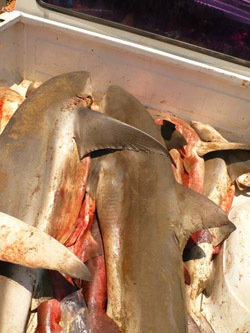 Seeing as all the smaller sharks are being killed, surfers look like a good meal. Good going sh&t heads !!! When humans off-balance the natural balance of the eco-system, we all suffer. Maybe someone should look into why sharks were searching for food where they haven’t in years. Maybe overfishing needs to be stopped. I live in a costal town in Mexico called Lazaro Cardenas, close to the spots where now 5 people have been attacked in the last fortnight. The people here a so scared none of my mates will paddle out with me anymore! I agree with Robert, survival of the fittest! What has a shark got that it can offer you? except death or medical bills? I beileve this is a reasonable way to restore saftey to these waters once again. Mexican authorities have actually tempered their response to the two recent attacks and are not hunting sharks now. They’ve been spotting from boats and helicopters and are doing a catch and release to determine the species of sharks in the area. Seems like a better response than haphazardly hunting and killing sharks. if you can catch and release them that is better,but i live here and would be very surprised to see such a program astonished acctually. 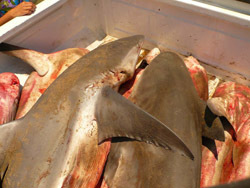 Killing the sharks of the are will only worsen the situation, I am surprised still some people believe this is the answer. 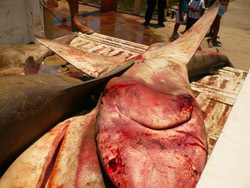 there is no way they will catch the shark, by the time they even started lookin it was hundreds of miles away. why do we venture so easily into the oceans where we know the most powerful, perfect predators live with out the slightest care in the world. we dont go into a jungle without takin precautions. and why are we blaming and slaughtering animals for doing exactly what God put them on this planet to do- survive. no one has any right 2 blame this animal. the humans took the risk of going into another predators domain and that therefor made them fair game. thats the risk every person takes getting into the oceans. people are so ignorant..